Green and white have long been colours associated with Cork soccer. 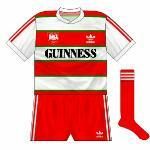 The original Cork United wore those colours, as did Cork Athletic and Cork Hibernians. 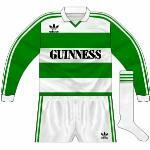 While Cork Celtic did too, they also wore plenty of other combinations too. The second incarnation of Cork United wore red, white and black, however, having had red shirts with a black hoop when they were known as Cork Alberts. 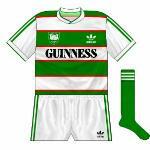 After United's demise in 1982, Cork went a whole two years without League of Ireland representation, with the most notable footballing occurrence on Leeside being Cobh Rambers' qualification for theFAI Cup semi-finals in '83, losing to Sligo Rovers after three replays, with Flower Lodge packed for the first and third games, Cobh's St Colman's Park not deemed suitable to host games of such high import. While Ramblers lost, a positive upshot was the interest shown by the Cork public, giving hope that there could once again be a market for league football in the city. 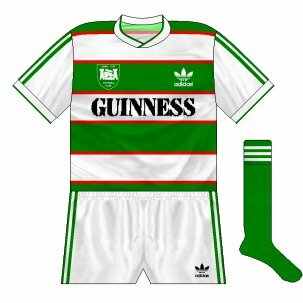 In the summer of 1984, Cork City Football Club was established, the new entity the brainchild of a group of people involved in the sport at local level, most notably with Avondale United, in the case of Jim Hennebry and Chris Herlihy. 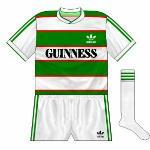 City's first shirts were green and white hoops with red pinstripes. It was ironic that the club's first game was against Avondale, in the quarter-finals of the Country Club Hotel Munster Senior Cup at the Lodge, their new home. Hardly surprisingly, it was not a glowing performance from the fledgling side, managed by former Chelsea star Bobby Tambling, and there were also blows in terms of first-half injuries to Bobby Woodruff and Paul Crowley. To top it all off, two of the club’s football were also stolen from the ground, never to be retrieved. Ultimately, goals from Billy O'Sullivan and Donal Madden (penalty) got them off to a winning start as they claimed a 2-1 victory. 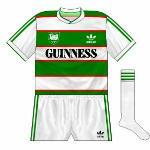 In that opening game, white shorts and socks were worn with the new jerseys, manufactured by the Kinsale Road-based Three Stripe International on behalf of adidas. 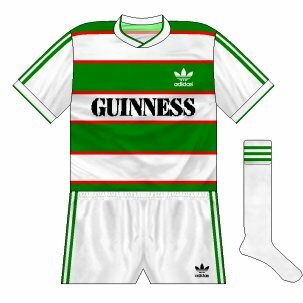 The shirts, which had the Guinness logo on the front, did not carry a crest at first (top left, click on all kits for larger view). One other notable kit 'incident' came in the home game against Athlone Town on February 17, 1985, when City wore what is one of the rarest in the club's canon. While it was green and white hoops, it carried no hint of red and the long sleeves - the only time that season that long sleeves were used - were solid green, bar the three white adidas stripes (right). In addition, a v-neck and a 'proper' collar featured. To the best of our knowledge, it never re-appeared in '84-85, and it was unlikely to have been used in the following season, as long-sleeved shirts matching the short-sleeved design were introduced. numbers were on white backgrounds, though oddly the double-digit numbers were in two separate white 'boxes' rather than one single one. Manager Tambling had been replaced by Tony 'Tucker' Allen after just league 13 games and City were finding life difficult in the top flight. 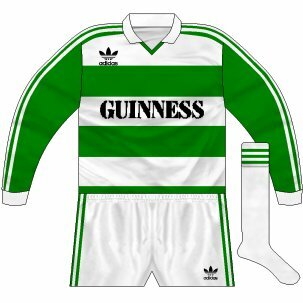 It was the last year of a single-division League of Ireland, with 16 teams taking part, but only one, Shamrock Rovers, caused a colour-clash with City. When playing away to eventual champions Rovers, who also had adidas kits as well as green and white hoops, City wore a change kit in the same design as their home kit, with the red and green reversed (left). Despite some shaky moments,City eventually rallied to finish in ninth place and ensure that they did not finish in the bottom four, which would have resulted in relegation to the new Division 1.